Sleep falls under Energy Regulation in The Center for Discovery’s Health E7 Program. Poor sleep can result in medical, psychological, and behavioral challenges, so it’s important that any environment is set up in a way to promote a good night’s sleep. Here are strategies from our Center-Wide Sleep Hygiene Plan that are designed to promote a restful sleep; however, these suggestions apply to anyone who suffers from sleep problems. Bedrooms should not be too dark, but also not too light. If the bedroom is too dark, try a small night light in the corner, whereas if the rooms are too light, leverage dim lighting outside of bedroom. Consider the noise level; bedrooms should be quiet at night. Others in the house should be mindful of voice volume when people are sleeping. Common noise culprits include appliances and televisions. White noise machines are commercially available devices that can help in situations where noise is not easily controlled. There are also apps that play white noise, which can be helpful. It’s best to limit the bed to sleeping. This means no activities in bed such as reading, or the iPad outside of bedtime. If this is not possible, consider keeping a separate blanket or pillow that comes out at bedtime as a cue that it is time for sleeping and not for another activity. Bedtime routines should be short and predictable. Routines should include soothing activities; avoid activities that stimulate and arouse the brain (i.e. TV, computers, bright lights, loud music, and exercise). You will need to decipher which activities are stimulating and which are calming. Remember that everyone is different. Routines should be done in the same order each night. 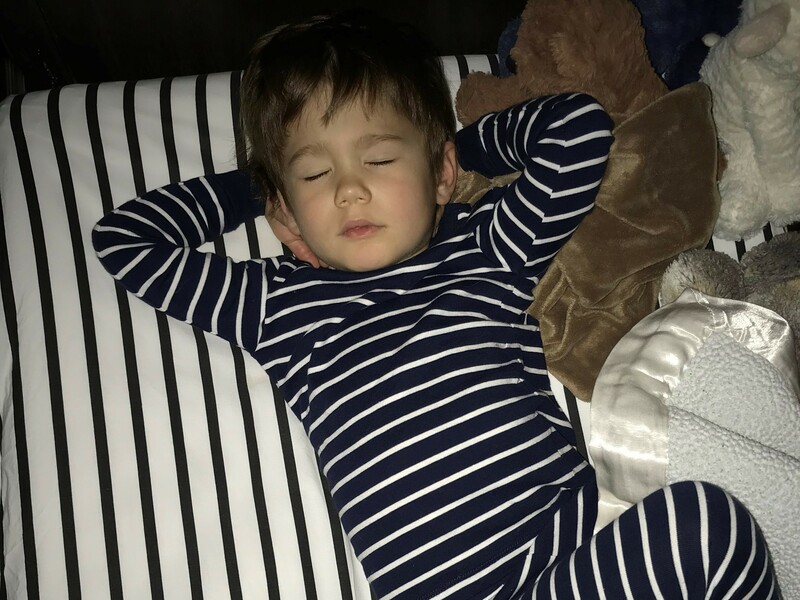 Time it right: if your child is still awake an hour after bedtime, consider adjusting his/her routine to 30-60 minutes later in order to help with sleep patterns. Early to rise: keep the wake time consistent; don’t deviate by more than an hour on weekends or vacations – the more regular the wake time, the better sleep will be. Naps: Naps should be avoided in older children and adults. If naps are taken, keep nap time on a regular schedule. Naps should not be taken past 4:00pm as sleep at night will be hindered. Food Matters: meal times should be consistent, even on the weekend. Avoid heavy meals and snacks late in the day. Don’t forget to use visual supports for the evening routines, especially if your child uses such supports at other times of the day. It’s best to minimize involvement when your child wakes in the middle of the night. Check to see if toileting or refreshing is necessary or if there is a health concern, and if not, gently guide your child back to his or her room using minimal language. Many of these strategies are adapted from the Autism Speaks Sleep Tool Kit. For more information, please click here. Written by Johanna Lantz, Ph.D., BCBA, Chief of Psychology at The Center for Discovery. For more information about supporting our HealthE7 model, please contact Richard Humleker, Vice President of Development, at rhumleker@tcfd.org.